A humorous and playful artist heavily influenced by the all too familiar trivialities and banal objects of the daily humdrum, which he extends or manipulates to distort reality as we know it and thereby subtly questions the antics of Western civilization. A central tenet of his oeuvre is weight gain / loss and philosophy, which he not only applies to humans but objects, adding or subtracting material to an object. One Minutes Sculptures is Erwin Wurm’s on-going series, in which he portrays either himself or instructs others to act in temporary and fleeing poses with everyday objects, which is then captured via photo and film. As a result he is subversively questioning the very definition of sculpture – an approach that was paid tribute to by the Red Hot Chili Peppers in their music video “Can’t stop”. The tome in question compiles Erwin Wurm’s instructions for the One Minute Sculptures, i.e. 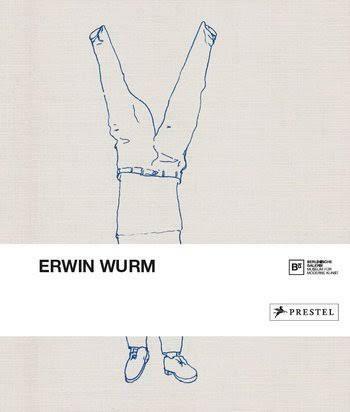 humorous drawings culminating in over one hundred large-format illustrations that come with the supplementation of three essays shedding light on the central topics and motivations that inform Wurm’s approach to his idiosyncratic art. A beautiful addition to any bookshelf in the home of aficionados of contemporary art.